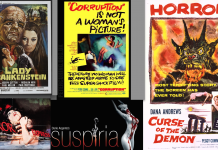 Regular Dark Side contributor Dr. Karen Oughton reports on the most recent edition of one of London’s two biggest commercial genre conventions. 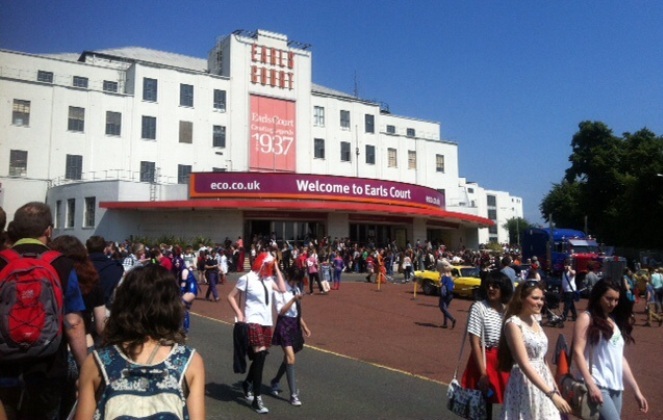 London Film and Comic Con has just taken place at Earls Court. 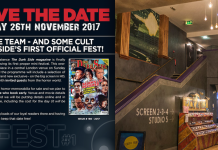 Organisers Showmasters have expanded the event to fill both the Earls Court 1 and 2 buildings giving room for film and TV sets, talks (the big draw being Stan Lee), cosplay and a huge array of memorabilia. Stan Lee (who was reportedly on his last European visit) signed autographs, posed for photos with fans and took part in a number of events including Q&A sessions and a press discussion. The topic of the latter was invariably the enthusiasm he still has for every one of his characters and he was magnetic as well as extremely funny, requesting nomination for an honour from the Queen. He was joined by a plethora of other big names including George A. Romero and John Hurt, whom some of us will remember for The Shout and 10 Rillington Place as well as his famous role in Alien. There was, of course, plenty to spend your money on and the halls were complete with stalls selling t-shirts, props and a stand from Arrow that went down particularly well partly owing to the competitive pricing and wide range of titles. The attached (living) zombie also seemed to help with PR. Another major draw was the cosplay. For the uninitiated, cosplay involves fans dressing up as their favourite characters either as cannon-correct incarnations or in clothing inspired by them. The effect can be anything from extremely intricate, homemade but professional-looking full body suits to outfits bought from fancy dress shops and naturally the effect can vary wildly. The aim of cosplay is to bring the characters to life and players generally try to stay in role. This was impressive at London Film and Comic Con as it was absolutely boiling hot, so kudos is due to troopers including a Borg, Whovians and an absolutely enormous Chewbacca. I also got in on the act and cosplayed Desire from Neil Gaiman’s The Sandman. For anyone who knows of the character, the license it offered was endless – it was great fun being a professional flirt for the day! Most of the attendees interviewed in the video here said they really enjoyed the atmosphere and the chance to meet their idols. That said, there have been many reports of long waiting times attributed to celebrity ill health, particularly (and understandably) relating to Stan Lee. This led to a number of signature and photograph seekers missing out on their sessions. A number have also expressed concern about overcrowding at the venue and indeed it was something of a trial to get from one end of the hall to the other. That said, event organisers Showmasters have stated that health and safety precautions were in place for the entire event. Showmasters are now said to be handling the issues of anyone with post-event queries and complaints. 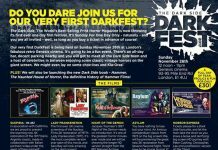 While there are perhaps lessons to be learned, Earls Court saw a lot of horror and fantasy fans go home happy and many are already planning to attend the winter event. Another video featuring non-exclusive material and featuring World Goth Day Best Model Winner 2012 Dark Morte as co-interviewer is available here.